Wow, this still goes on in 2016? (hugs).. sorry for such ignorant folks. Wow. That is seriously horrid. I'm sorry you had that experience. Before this election I would have believed thIs was a rare thing, but know better now and it is shameful. If China wants you, they better be prepared for war. We're not giving you up without a fight. Pretty sad and lonely elderly women. I hope her dog likes her? This is a pretty big world and I bet she never leaves her block? I love you, Connie to the Wonnie. I agree with Knierim. I do not think China would want to fight all of your fans. Oh Say Can You See All Connie's Fans coming to Fight !!! As an African American though, I can maybe understand what you are saying Connie. Every now and then I will run into a very old racist. Working at a hospital, I have been there when some of them come out of surgery, wake up, and find themselves in a room full of Blacks, Asians, Hispanics and Africans medical personnel. I sorta started to feel a bit sorry for them. I just wonder how many faces that they have cursed at, spit on, or burned crosses on the lawns of in their distant past. Now in the twilight of their lives to be surrounded by nothing but minorities without a White face in sight. Some of them I declare that you can almost tell the level of hateful things they have said or done in the past, just by looking in their eyes in that brief moment. I feel sad for them. You know that racism will still go on and we need to also work on the racism within the minority cultures towards each other. 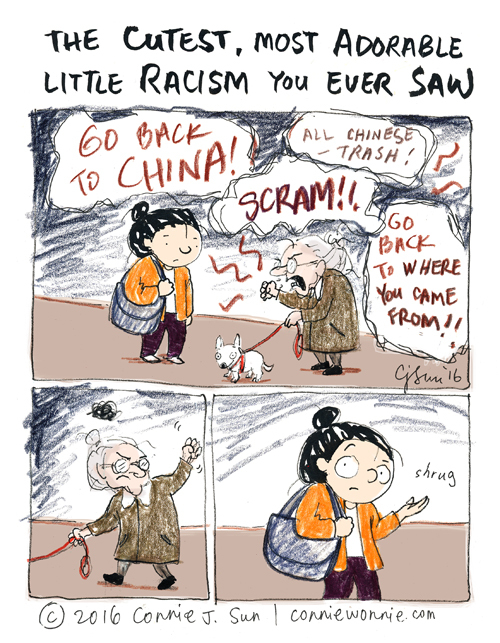 It is not only the cute old White people, but there are a few old minorities that are holding on to some pretty nasty racism. Maybe as all of those of that generation pass on, there will be less and less racist to replace them. Considering you were born in the US, that's pretty awful. It works the other way, too, though. Americans living abroad are often told "Yankee go home" or asked why "your president" did this or that as if we were directly responsible. I have been asked "Why don't you go home?" I reply, "I am home. I'm a naturalised citizen, thank you for asking." Ignorance can be treated with information--but there ain't no cure for stupid. You are where you came from! I wish I knew what has become of this nation. It looks like those thirty and younger will resolve the question of race and gender. Go, kids, go!